On Sunday, January 1st, the children of the parish put on a Christmas Pageant following the Divine Liturgy. Afterwards, we enjoyed hearing the youngsters sing carols and perform instrumental pieces in the hall. Christ is born! Glorify Him! On Sunday, January 1st, we kept the custom of St. Basil's Bread (The Vasilopeta). This year the coins were received by David McAlpin, Laurie Morsey, and Elisabeth Parsells. May the Lord grant them many blessed years! On Friday, January 6th, the faithful gathered to celebrate the Great Feast of Theophany, which commemorates the Lord's Baptism in the Jordan River and the manifestation of the Holy Trinity. On the eve, we served the Great Blessing of Water during the festal vigil. 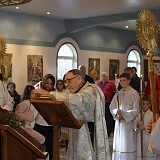 On Sunday, January 15th, the Christ the Savior family celebrated the 90th birthday of Protopresbyter Daniel Hubiak, the founding priest of the Mission. We were pleased to welcome guests from near and far for the festivities, including Fr. John Jillions, chancellor of the Orthodox Church in America, who read a letter from His Beatitude Metropolitan Tikhon on this auspicious occasion. We heartily congratulate Fr. Daniel and Matushka Dunia on this great milestone, and we ask the Lord God to continue His blessings upon them, granting them both health, strength, salvation, a furtherance in every good thing and many more blessed years! 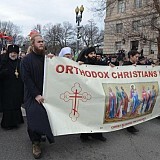 On Friday, January 27th parishioners from Christ the Savior joined other Orthodox Christians and hundreds of thousands of people who gathered for the March For Life in Washington, DC. The march is a pro-life rally protesting abortion, held in the nation's capital near the anniversary of the infamous decision in the United States Supreme Court case Roe v. Wade. This year marked the 44th anniversary and featured an address by Vice President Mike Pence. On Sunday, January 27th, the parishioners of Christ the Savior gathered together for their annual meeting. In addition to reviewing the minutes from last year's meeting, the parish body heard reports from the rector, senior warden, junior warden, treasurer, and auditors. We recounted and gave thanks for all the great blessings we received during the past year, including celebrating the 90th birthday of our founding priest, Fr. 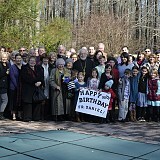 Daniel Hubiak, and the extraordinary retiring of the mortgage on the Parish Center some 15 years adhead of schedule! On Sunday, February 12th, Robin Adelaide Armstrong was joined to the Orthodox Church through the mysteries of Holy Chrismation and Communion. We heartily congratulate her on her entrance into the Church, and we ask that the Lord continue to bestow His heavenly blessings upon her, granting her health, strength, salvation, a furtherance in every good thing, and many blessed years! 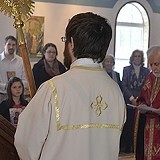 On Sunday, March 5th, the local Orthodox parishes in Delmarva gathered at Christ the Savior in Berlin, MD for this year's solemn celebration of the Triumph of Orthodoxy. Serving with Fr. John were Archimandrite Vasilios from St. George Greek Orthodox Church in Ocean City, MD and Protopresybter Daniel Hubiak, the founding priest of the mission. Many faithful gathered for the Sunday of Orthodoxy Vespers which was followed by a lenten meal in the parish hall. Glory to God for such a beautiful day and for preserving His Church by Holy Orthodoxy! On Sunday, March 5th, with the blessing of our diocesan hierarch, Metropolitan Tikhon, the 2017 Parish Council members were installed into office. During the first meeting of the 2017 Council, Nicholas Borodulia was elected Junior Warden and Gabriela Vlahovici-Jones was elected Secretary. May the Lord bless them all! On Friday March 10th, Dn. 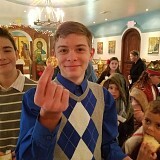 Steven Hall led a group of pilgrims from Christ the Savior to Four Evangelists in Bel Air, MD, where the miraculous Kardiotissa “Tender Heart” myrrh-flowing icon of the Virgin Mary from St. George Orthodox Church in Taylor, PA, was brought for veneration. A moleben (prayer service of supplication) to the Mother-of-God was served before the icon, followed by anointings. 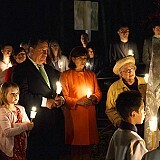 On Palm Sunday, April 9th, the faithful gathered to celebrate the Lord's Entrance into Jerusalem. The church was packed for this highly festive day. During the Divine Liturgy, Joseph Dunbar was received into the Orthodox Church through Holy Chrismation. Following the beautiful divine services, a traditional Bakaliaro fish meal was offered for all present. Glory be to God for all things! On Great and Holy Wednesday, April 12th, the faithful gathered for the Mystery of Holy Unction, the anointing with holy oil for the healing of soul and body. The Church’s practice of Holy Unction dates back to Apostolic times, see James 5:14. 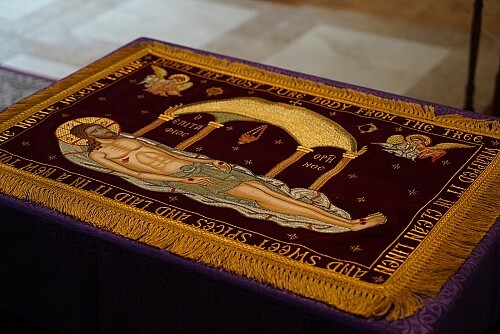 From April 9 - April 15, the faithful gathered at Christ the Savior to celebrated the solemn liturgical services of Great and Holy Week, which commemorates the Lord's voluntary Passion, His Cross, Death and Burial. On Sunday, April 16th, the faithful gathered for the Midnight service, celebrating the Feast of Feast, Holy Pascha, which commemorates the Resurrection of our Lord God and Savior Jesus Christ. Over 125 people gathered for the celebration of the liturgical services which were followed by the blessing of foods and a festive meal in the hall and rectory. We greet you all with the joyous exclamation, "Christ is risen! Indeed He is risen!" On the Sunday of the Myrrh-bearing Women, April 30th, an egg hunt was held for the children of the parish. As we know, the egg is widely used as a symbol of the start of new life, just as new life emerges from an egg when the chick hatches out. However, there were of course no chicks in these eggs, just chocolate and candy - much to the delight of the children and the dread of their parents! On Wednesday, May 10th, on the Feast of Mid-Pentecost, we had the baptism of Walter Sterling Basil, son of Larry and Tara Casserly. We congratulate them as well as, Fr. Joel and Matushka Tessi Wilson, the sponsors, the entire family and all their friends. May the Lord God grant Walter Sterling Basil and them all heath, strength, salvation, furtherance in every good thing and many bless years! 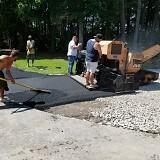 On Sunday, May 28th, the following prayer was offered for the annual blessing of the pool: O Lord, how marvelous are Thy works. In wisdom hast Thou made them all. Send down Thy heavenly blessing upon this pool. Protect all who swim in it. Keep them safe as they enjoy the recreation and fellowship which it provides. For Thou art the Provider of every good gift, Who dost fill our hearts with joy and gladness, always, now and ever, and unto the ages of ages. Amen. On Sunday, June 6th, the faithful gathered to celebrate the feast of Pentecost. As is customary, the Vespers with Kneeling Prayers was served immediately following the Divine Liturgy. We congratulation all who celebrate on this high holy day! On Sunday, June 18th, prayers were offered at the completion of the academic year, thanking the Lord for the blessing of His wisdom and knowledge, and asking Him to preserve the students in that which they have learned which is according to His divine law. On Sunday, July 16th, the faithful of Christ the Savior gathered for the Divine Liturgy followed by the Blessing of Automobiles. This annual blessing occurs near the feast of the Prophet Elias (who ascended as if into heaven in a fiery chariot). Photos from the blessing are below, together with a video produced showing the day from the eyes of a child. Enjoy! On Sunday, August 6th, the Feast of the Transfiguration of the Lord, grapes and various fruits were blessed at the conclusion of the Divine Liturgy. We greet you all with the exclamation, "Joyous Feast!" During the week of August 20-25, final preparations were made for the upcoming historic visit of Metropolitan Tikhon to Christ the Savior to elevate the mission to full parish status and celebrate the 90th birthday of its founder, Protopresbyter Daniel Hubiak. His Beatitude Metropolitan Tikhon visited Christ the Savior from August 25-27 to: 1) raise the mission to full parish status, 2) celebrate the 90th birthday of Protopresbyter Daniel Hubiak, who is the church's founder, and 3) to lead the annual Diocesan Day celebration. 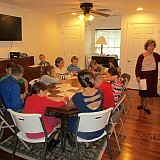 On Sunday, October 15th, the church school academic year began. Teachers this year are Nissa Nancy Hall and Patricia McAlpin. We ask the Lord's blessing upon them and all their students who today begin their studies anew in the way of the Lord. On Sunday, October 29th, prayers were offered at the end of the Divine Liturgy for those in the healing ministries. We ask the Lord's continued blessings upon all those who work with Him in the healing of mankind's physical, emotional, and spiritual wounds and illnesses. May the Lord grant them many blessed years of faithful service to Him and their fellow man! On Sunday, October 29th, we had the Chrismation of Margaret Juliana LoGerfo. We sincerely congratulate her on this joyous occasion. May the Lord grant the newly-illumined handmainden of God, Margaret Juliana, many blessed years! This year's celebration of the Lord's Nativity was very joyous in part due to the record attendance, as faithful parishioners and friends gathered for worship and fellowship on this high Holy Day. As we give thanks to God Almighty, we also ask His divine blessings upon one and all during this season of peace and spiritual joy! Christ is born! Glorify Him! 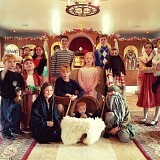 On Sunday, December 31st, the children of the parish put on a Christmas Pageant following the Divine Liturgy. Many thanks to all the teachers, parents, and children who did a great job! Christ is born! Glorify Him! Congratulations to the recipients of St. Basil’s Coin: Fr. Daniel Hubiak and Sebastian Klimitchev. The other coins were in the pieces cut for the Lord Jesus and Elisabeth Parsells. Many Years to the recipients!